$38.10 per customizable Rickshaw Bags® iPad sleeve. Handmade with a sustainability focus in the US. Turquoise blue and hot pink abstract floral personalized Rickshaw iPad sleeve. You can personalize the name using the personalize option or make more extensive changes using customize it! A bold and pretty girly design. Rickshaw Bags® iPad sleeves are made with rugged Cordura® nylon and have an ultra-plush padded liner. These stylish sleeves provide great protection for your device. These are manufactured on demand from scratch in San Francisco with a focus on environmentally sustainable manufacturing. Easily personalize any text or add your own text for a custom look. The Zazzle website has all sorts of options for customization. You can choose your own trim and lining color too. Perfect for iPad or iPad 2 (w/smart cover). Water resistant, extra durable construction. Fully handmade in the USA. Protective foam padding; Ultra-plush lining. Choose from a variety of binding and liner colors. Note: Zazzle Rickshaw Bags® sleeves are manufactured on demand. Therefore, manufacturing times are longer. Please allow 10-21 business days for manufacturing. *Shipping estimates will vary depending on the shipping method selected at checkout, and are not included in the manufacturing turnaround times posted. 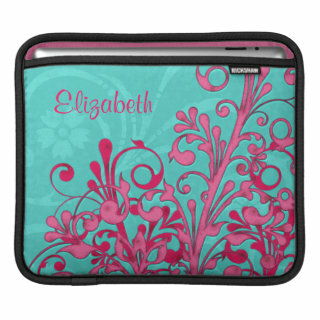 Zazzle Rickshaw Bags® sleeves are manufactured, printed, and shipped in the US, even if ordered off of international sites. Please allow sufficient time for international shipping.